This month I am swearing off soda and extra sugar. By extra sugar I mean no more adding sugar to my coffee and tea. I am going to avoid those over processed sugar-laden snacks and eat healthy fruits and veggies. I am going to avoid those fun flavored bags of potato chips and stick with rice cakes -yes, I love rice cakes – especially those brown rice cakes from Whole Foods. And <gasp> I like my rice cakes plain, no cottage cheese, no jelly, just plain. But I know I will not have the willpower to survive on rice cakes alone. So I am going to be making a few healthy snacks I can keep stocked in my kitchen for those weak moments. 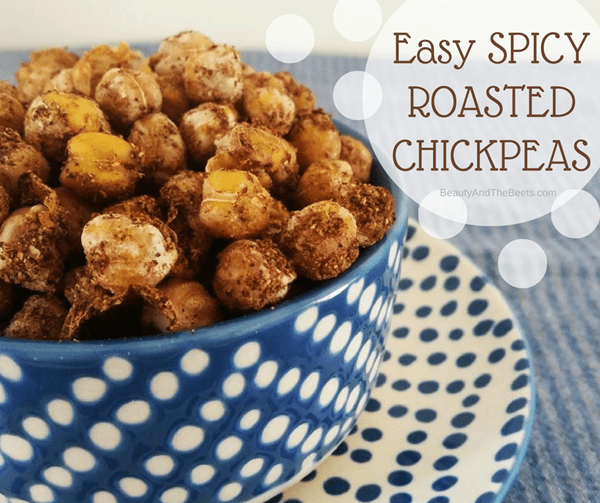 Hence this super easy-to-make Spicy Roasted Chickpeas recipe. 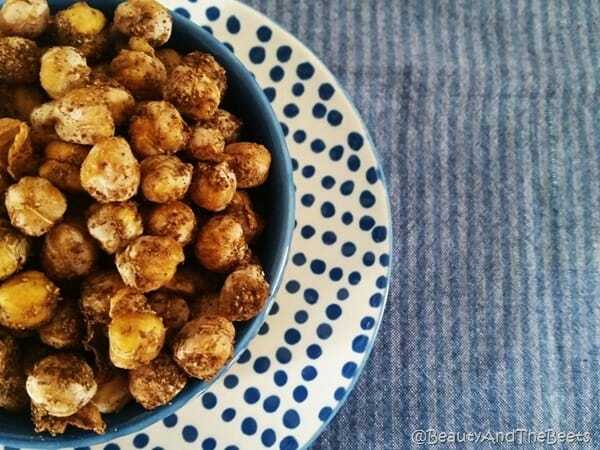 The beauty of roasted chickpeas is not only the sheer simplicity of them, but also their versatility to taste good with almost any spice you desire. Nowadays changing spices on food is as easy as heading to the grocery store. No longer are we having to spend time in our kitchen mixing spices to achieve a Mediterranean flavor, or a Spanish flare. spice companies have done all the mixing for you. I personally love the spice mix of Garam Masala which quite literally translates to “hot” (garam) “mix of spices” (masala). Garam Masala is traditionally used in many Indian dishes as well as other South Asian foods. The basic mix consists of cumin, coriander, cardamom, pepper, cloves, cinnamon and nutmeg. Many Indian dishes are seasoned with a characteristic blend of zesty, aromatic and fragrant spices. The hardest part of this recipe is drying the chickpeas so they are ready for roasting. 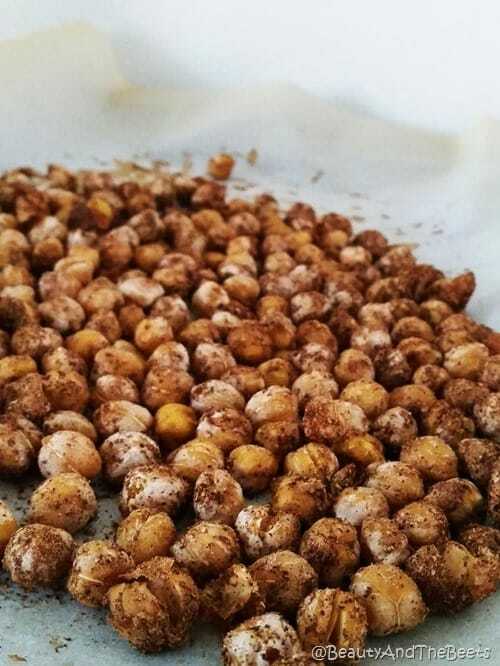 After I drain and rinse the chickpeas, I dry them as well as I can with a kitchen towel, then I either allow them to further dry by zapping them in the microwave for about 60-90 seconds. 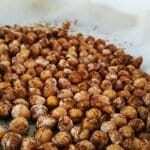 Once the chickpeas are dried, I toss the chickpeas in olive oil and a few tablespoons of Garam Masala. Next is the roasting process in a hot oven. And then I proceed to eat the roasted chickpeas like popcorn. Or potato chips. Anytime I am craving something on the savory and crunchy side. And again, my recipe uses the spices of Garam Masala but any spices you crave will be just as tasty, including a simple mix of paprika and salt. Or garlic salt. Or…BBQ seasoning…you get the idea. Enjoy! 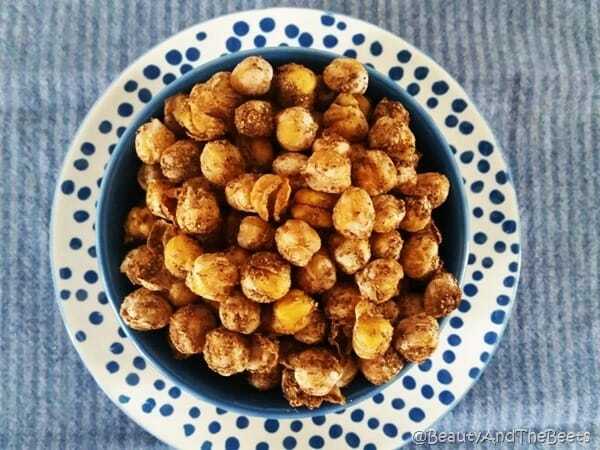 Crunchy and spicy chickpeas. Healthier than microwave popcorn and zestier than potato chips. Preheat the oven to 450° Rinse and drain the chickpeas. Spread the chickpeas out on a non linty kitchen towel and blot the chickpeas dry as mush as possible. 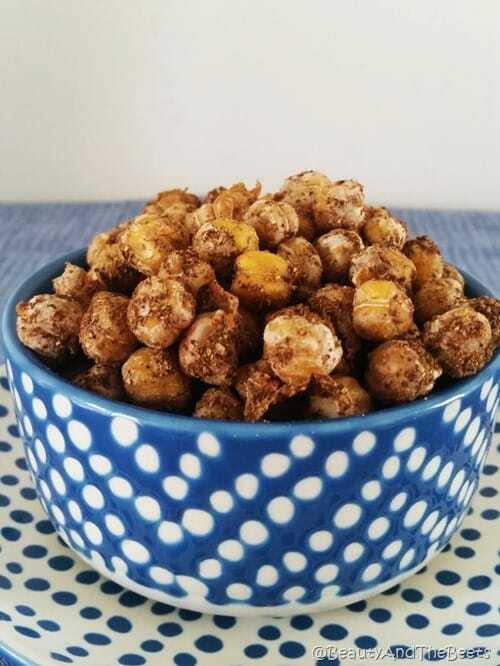 Place the chickpeas in a microwave safe dish and zap for about 60 seconds in the microwave to further dry the chickpeas. Add the chickpeas to a medium sized bowl, add the olive oil and the Garam Masala. Mix well. Spread the chickpeas in a single layer on the parchment lined baking sheet and place in the oven. Roast the chickpeas for 30-40 minutes. After 30 minutes, taste a chickpea and if they are not fully crunchy inside, cook for an additional ten minutes. Serve immediately or store in an airtight container for up to a week.